Mayor Rahm Emanuel and Chicago Public Schools CEO Barbara Bryd-Bennett announced that CPS students in School Year 2013-2014 (SY 13-14) set a record graduation rate of 69.4 percent. The graduation rate this past year marks an all-time high for the district, which graduated 65.4 percent of students in SY 12-13. The SY 13-14 graduation rate continues a consistent upward trend and represents the largest two-year increase in district history. Two years ago, 61.2 percent of CPS students graduated, and three years ago, 58 percent of CPS students graduated. The graduation rate announced today measures the percentage of students who entered ninth grade in fall 2009 and graduated by the spring and summer of 2014. 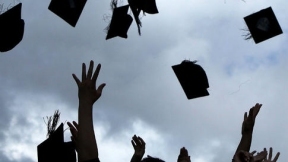 Earlier this year, the University of Chicago Consortium on Chicago School Research (U Chicago CCSR) announced that 82 percent of last year’s high school freshmen are on track to graduate, an increase of 25 percent from 2007. This increase is largely attributable to CPS’s targeted strategy to reduce course failure in the ninth grade, which UChicago CCSR research suggests is a critical for student success. Last year, 57.2 percent of CPS graduates enrolled into college, which was an increase of 1.2 percent from 2012.